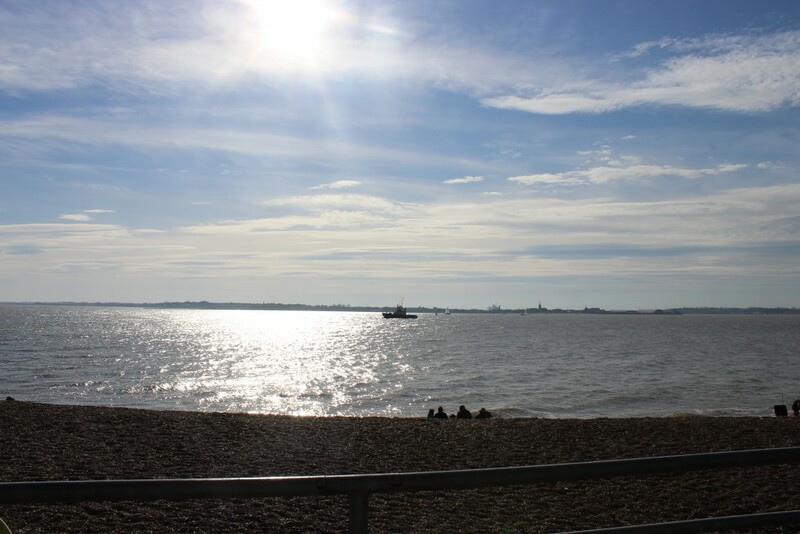 Home / Attractions / Just One of Many Reasons Why You Should Visit Felixstowe! When on my travels across Suffolk, once I’ve arrived at my destination it’s nice to sit for a bit, get myself organised and go back over my plans to make sure I make the most of my visit. The opportunity of doing this over a cup of coffee is even better and Felixstowe has just the place to do this. Looks can be deceiving…. this is no ordinary cafe! 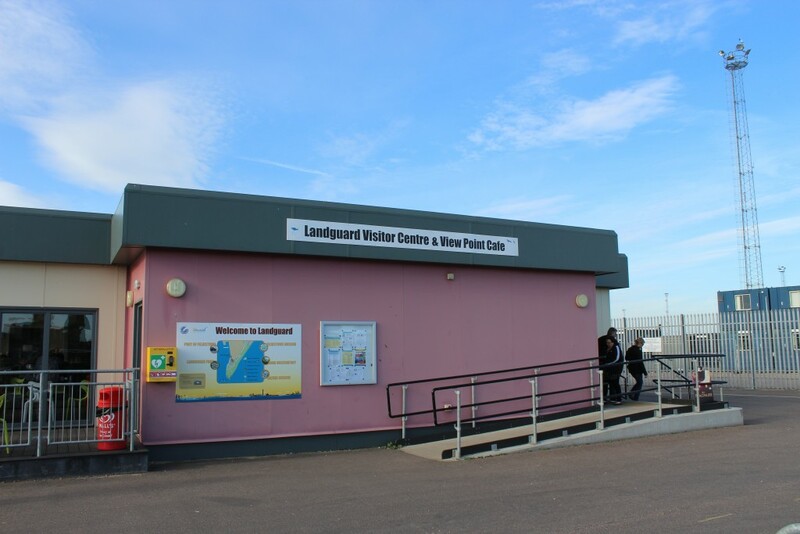 You can imagine my surprise when on one of my first trips to Felixstowe this year I came across the Landguard Visitor Centre & View Point Cafe. When approaching from the car park, it looked nice and welcoming and being painted my favourite colour was a plus! Once inside I ordered my coffee (and a cheeky bit of cake!) and headed to sit on the chairs outside. The view is so amazing that to be honest once I sat down with my coffee it was very hard to leave! 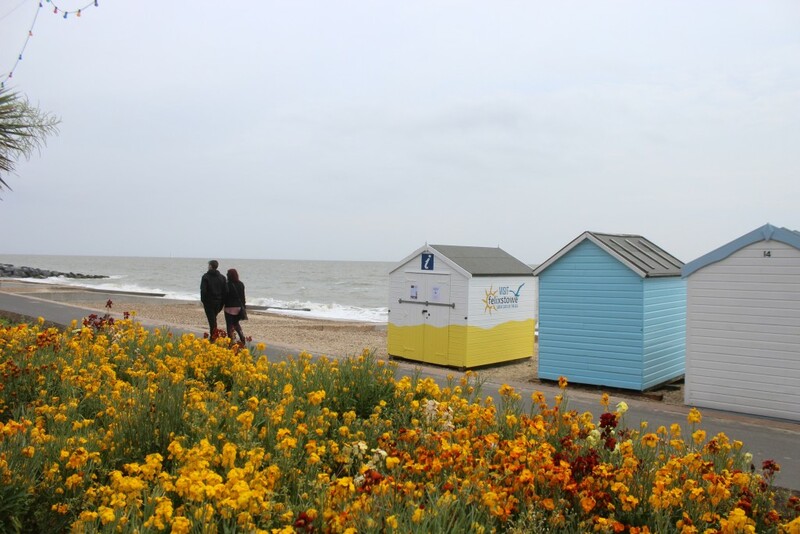 Felixstowe is fast becoming one of my favourite places in Suffolk (I know I seem to say that a lot, but we do have some great places to choose from!). 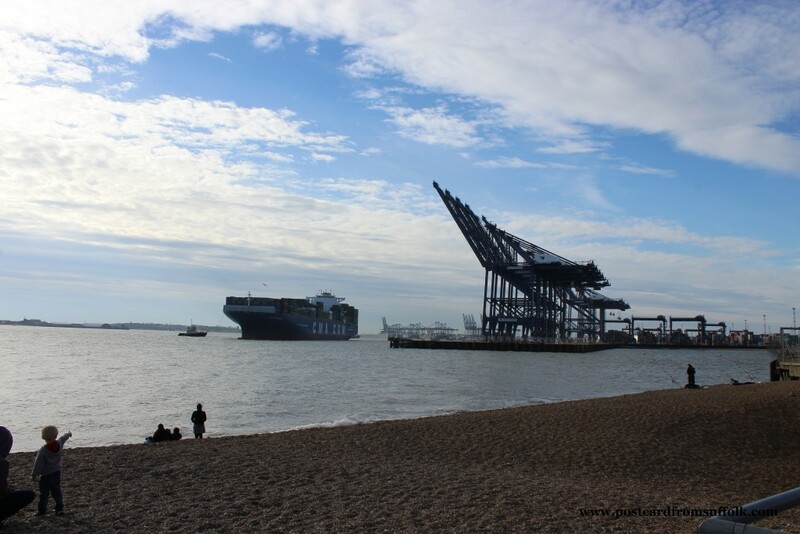 It is only this year that I have really truly discovered Felixstowe and every time I visit I find something else about this great place that has me planning my next trip before I leave! Of course the view in the photo above looks lovely, but whilst sitting overlooking the sea, it’s the view to the right of this that I find really exciting….. 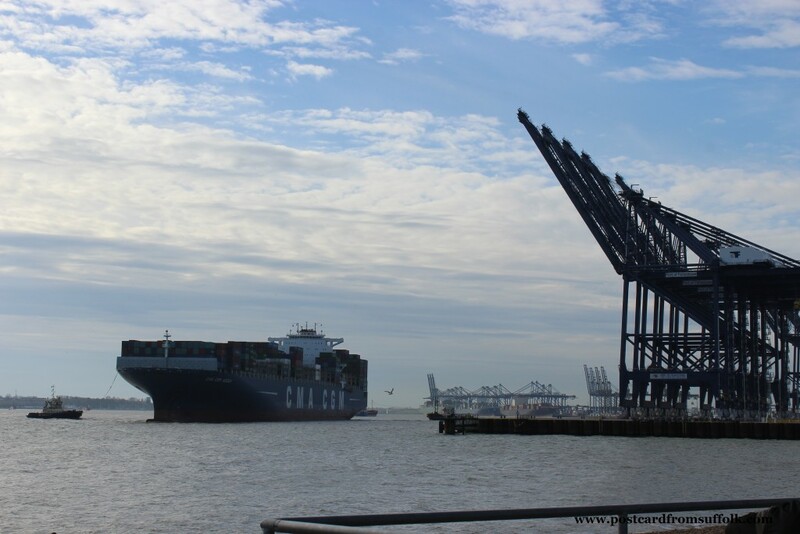 Superb View of the Port of Felixstowe! I love that the little kid at the bottom of the photo above was as excited as me! Maybe the reason I find it so exciting is perhaps because that both my dad and my granddad were dockers in the east end of London and I remember going down to the docks with my dad on a few occasions for a look around, although its clear from what you can see at the Port of Felixstowe things have moved on a lot since the 1970’s! 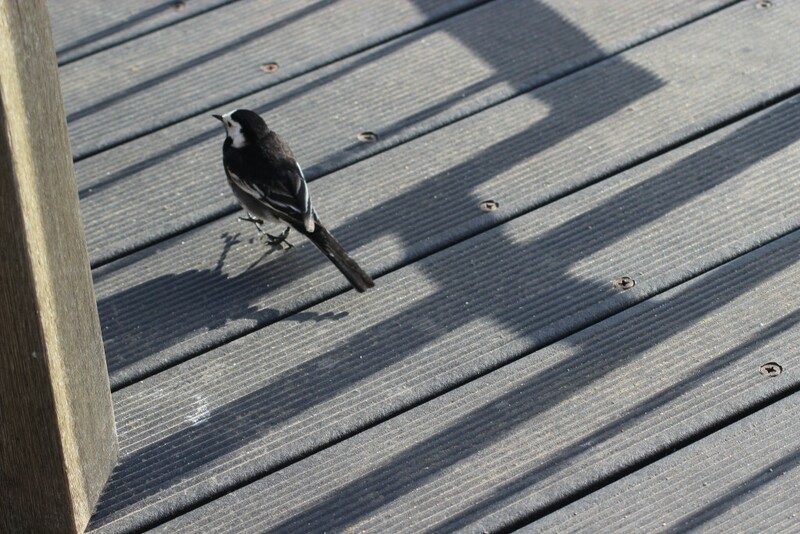 Whilst sitting having my coffee and cake (which was lovely by the way and very reasonably priced) I had a visitor which was not surprising as the cafe is right next to a nature reserve. Yes that’s right the port is right next to a nature reserve – seems hard to believe really but if you take a walk once you leave the cafe, in a minute or two you will discover Landguard Nature Reserve with a whole range of cool things to see and do. 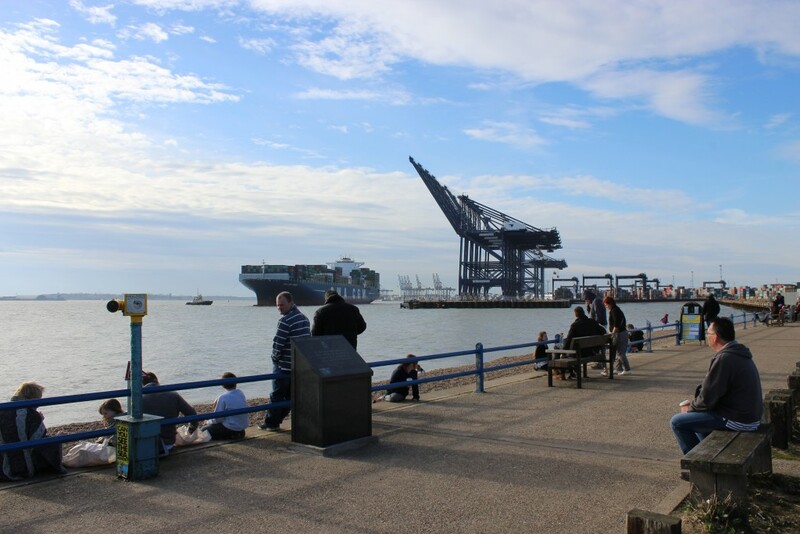 The view point and port at Felixstowe is a popular ‘attraction’ that seems to draw lots of visitors of all ages. My visit on this occasion was around tea time and there were still lots of people enjoying themselves. People relaxing enjoying the unique view! Voted as one of Suffolk’s Top 50 I can see what’s so appealing. It really is a unique place and you can spend ages there just watching as you see ships unloaded. 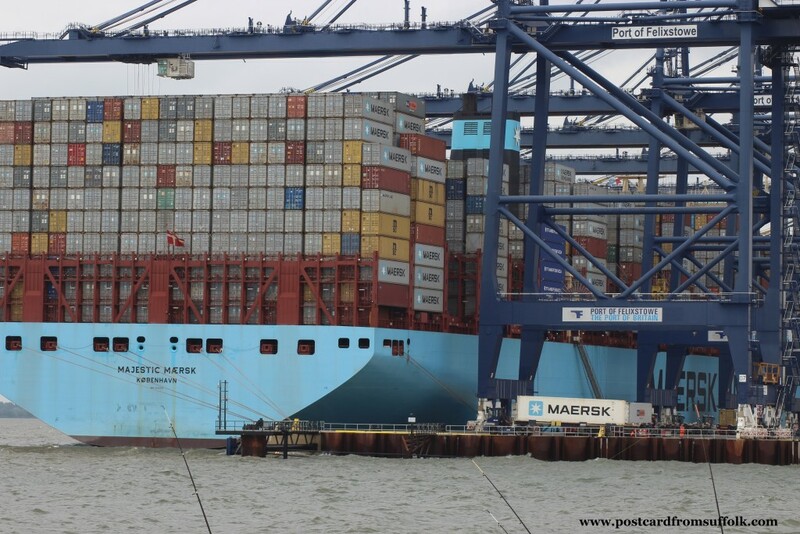 The sheer scale of the cargo on the ships is unbelievable and how it all stays afloat on the sea is beyond me! 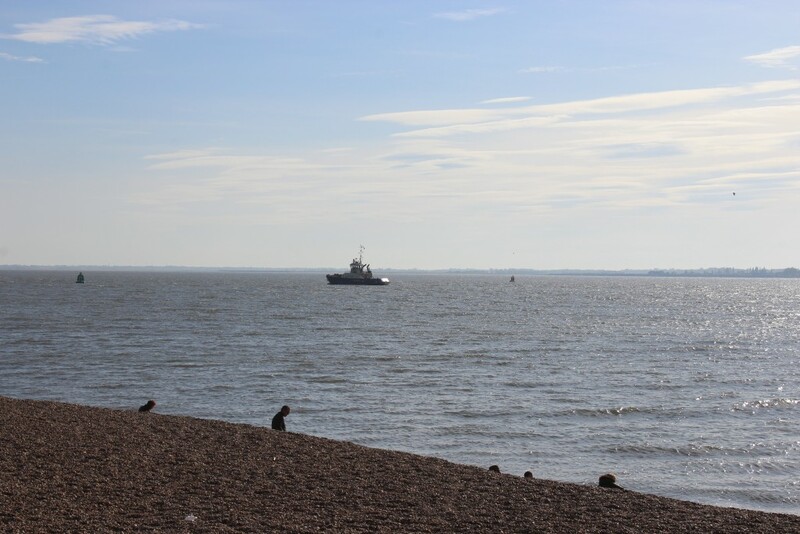 If you are visiting Felixstowe, the Landguard Visitor Centre is a great place to start. It has lots of information inside, there is free parking, the cafe is really good or if you prefer there are plenty of benches and the beach nearby if you want to take your own picnic. The nature reserve is a short walk away, which is amazing with its unique views of the port and the coast as well as all you would expect from a nature reserve and more! I love the idea of a beach hut as a tourist information point! As I mentioned earlier each time I visit Felixstowe I find out more about this wonderful place that makes me want to come back! The recent introduction of the Tourist Information Beach Huts has been a great for the town and remember they are not just for tourists! So if you get the opportunity make sure you pop in to one on your next visit, gather lots of information, ask some questions and before you know it you will become a regular visitor like me! 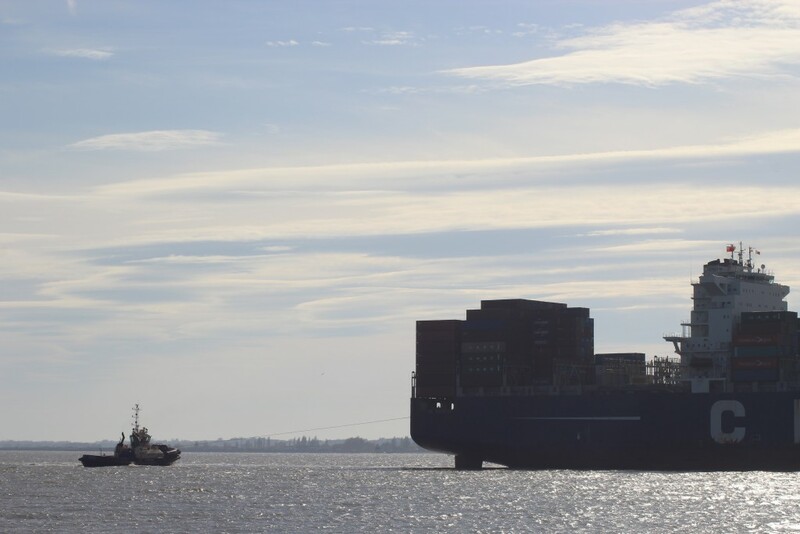 There’s so much more to explore in Felixstowe that you ever imagined! Would love to hear from you if you have any recommendations for my next visit!